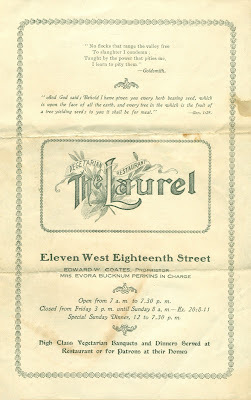 The Laurel was one of only a few vegetarian restaurants in New York at the turn of the last century. Technically, it was a lacto-ovo vegetarian restaurant in that it served dairy products and egg dishes. 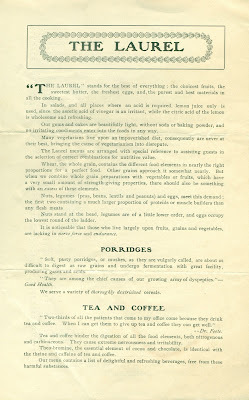 A menu from 1903 offers a wide selection of dishes, along with health tips, nutritional advice, and quotes from the Bible and the poet Oliver Goldsmith. 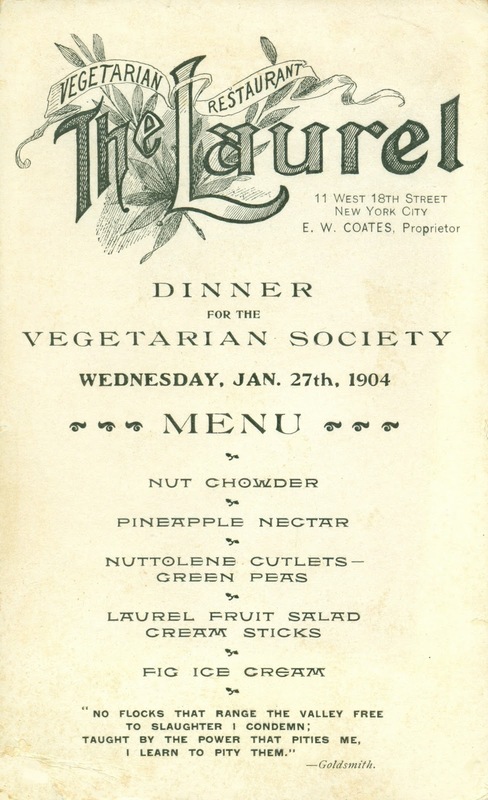 This à la carte menu, and a banquet menu from the following year, mark the reemergence of vegetarianism in the United States after a hiatus of fifty years. 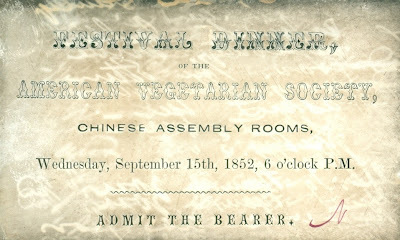 Despite having distributed the tickets, the dinner in 1852 was cancelled. 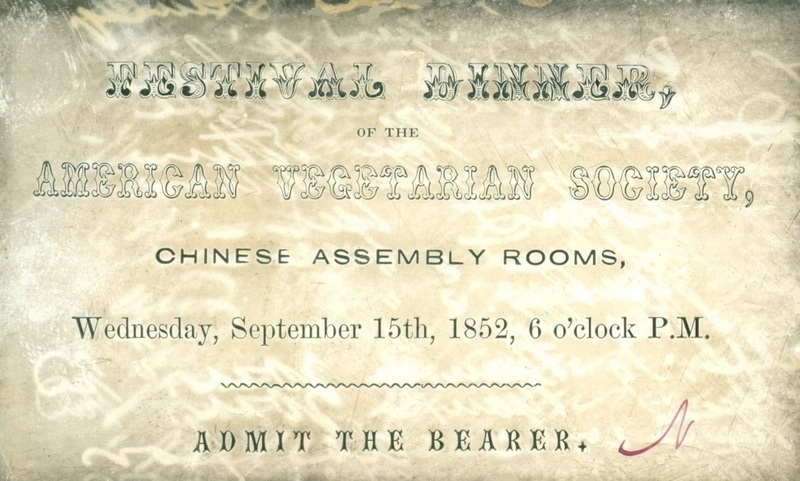 With their first meeting reduced to a series of speeches, the organizers put a good face on the situation, promising that the event would be a “feast of reason.” Such pronouncements only invited ridicule by the newspapermen who enjoyed mocking the vegetarians. The New York Times reported that the philosophical repast “was not as inviting as the pumpkin pies, melons, peaches, pears, grapes and apples that were first offered, if we may judge by the scant attendance." In fact, only fifty people attended. Things went much better the following year when newspaper editor Horace Greeley hosted the annual affair. This dinner attracted about 300 socialists, abolitionists, temperance advocates, and other antebellum reformers. Two-thirds of the attendees were women, including the suffragettes Susan B. Anthony, Lucy Stone, and Amelia Bloomer. 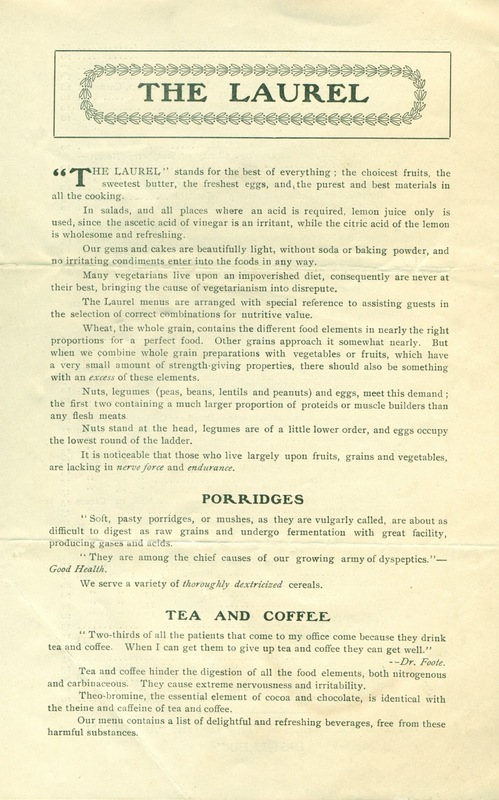 In 1904, people adopted a plant-based diet based on their religious beliefs, health issues, or opposition to the killing of animals, a sentiment reflected by Goldsmith’s poem. Today, the reasons for vegetarianism have expanded to include ethical concerns related to the mass consumption of meat, such as the treatment of animals in factory farms, environmental damage, and the exacerbation of world hunger. 2. 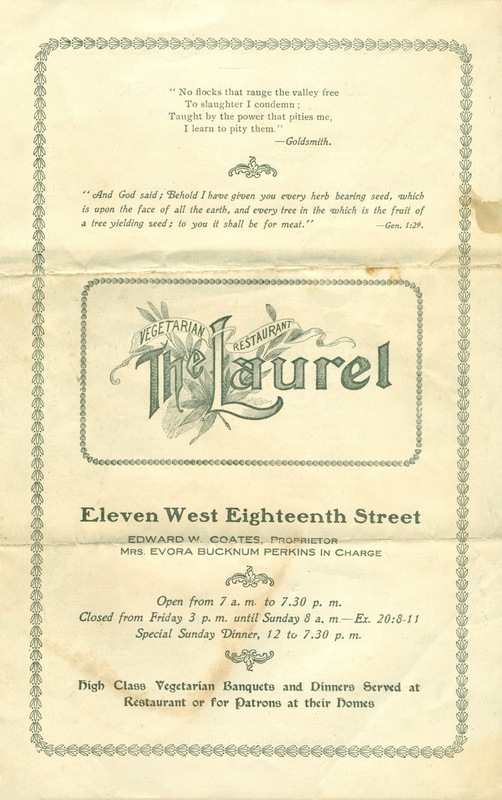 E. W. Coates operated a small heath food store before opening the Laurel on August 27, 1902. The Seventh-day Adventists regarded it as their second vegetarian restaurant in New York City. 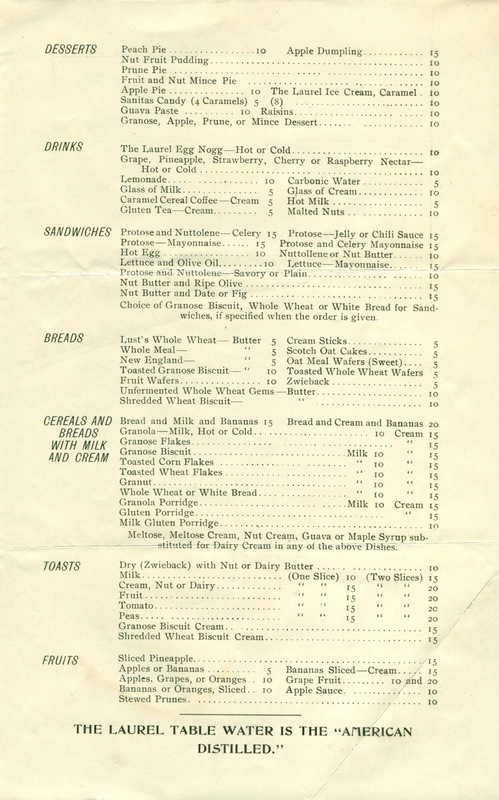 (The first was Health Restaurant at 391 Sixth Avenue.) “Another Vegetarian Restaurant,” The Bible Training School (Vol.01-04) 63. 3. In 1859, the old Chinese Assembly Rooms, situated on lower Broadway near Spring Street, were converted into a concert saloon named the Melodeon. Featuring “pretty waiter girls,” watered-down drinks, and dancing, the Melodeon is often cited as one of the first nightclubs. 4. Karen Iacobbo, Vegetarian America: A History, 2004. 5. Edward Fulton, Substitutes for Flesh Foods: Vegetarian Cook Book, 1904. Fascinating post. The menu is a gem. What is mysterious to me, though, is why no cheese? What you won't come up with next! This is delightful and a jewel of New York history. 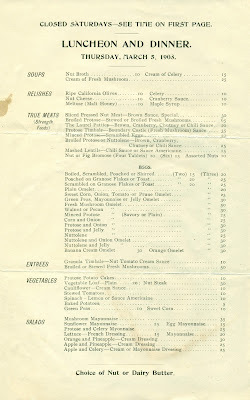 The mid 20th century New York I grew up in, had quite a number of truly superb vegetarian restaurants. In fact, I never encountered the same phenomena in Europe. This is indeed fascinating!! I can't wait to read it more thoroughly when I have some more time. Thank you for posting!! 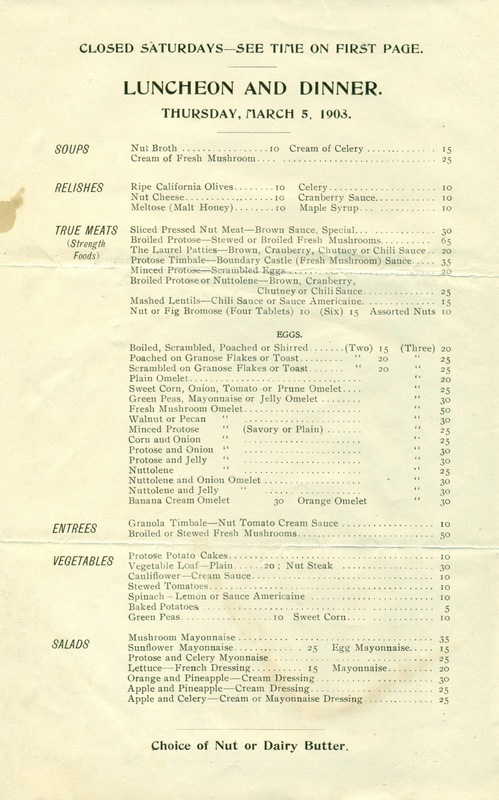 I loved this menu! It was so lengthy with many excellent choices. Thanks for your explanations of meat substitutes produced by Kellogg's. Newnham-Davis' Hors-d'oeuvre consisted of some olives. He enjoyed the carrot soup, but found the spinach "not up to club form" and the flageolets "not inviting." He enjoyed the duck's egg that had been well fried. Newnham-Davis ate his salad, passed on the Lent Pie (not sure what that was) and the stewed fruits, and then finished off with Gruyere cheese, almonds, raisins and an orange. His meal cost 1 shilling, 6 pence--quite a modest price. 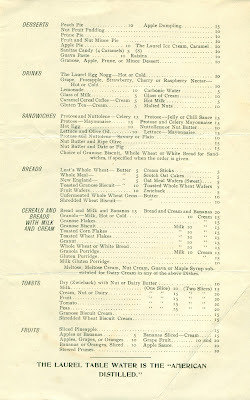 While Newnham-Davis was not overly impressed with the St. George's Cafe, he at least decided that it was important enough to visit and review for his column in the Pall Mall Gazette, and then later for his collection of restaurant reviews, Dinners and Diners: Where and How to Eat in London (1899, revised 1901).